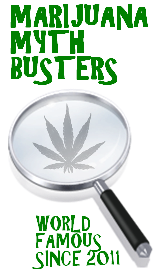 Marijuana Mythbusters » How old were you the first time you smoked marijuana? How old were you the first time you smoked marijuana? To the tried an true veterans who have been with us since last summer or maybe even last spring, you are familiar with our Pot Polls, and we are happy to tell you that after 2 1/2 months of trying to figure out how to get them up and running again we finally have found the solution. To everyone who is new here, or is just unfamiliar with our polls, take a few minutes to check them out, vote, and see what your fellow stoners have said regarding some of the things you’ve probably wondered about while you were high. If you have anything that you would like us to ask the world, please feel free to shoot us an email or hit us up on Facebook. This entry was posted by Mythbuster on January 23, 2012 at 3:40 pm, and is filed under Pot Polls. Follow any responses to this post through RSS 2.0.You can leave a response or trackback from your own site.